Posted on 4, May 2016 by EuropaWire PR Editors | This entry was posted in Austria, Chemicals, Energy, Gas & Oil, Transportation & Logistics and tagged Borealis, Navigator Gas, vessel Navigator Aurora. Bookmark the permalink. 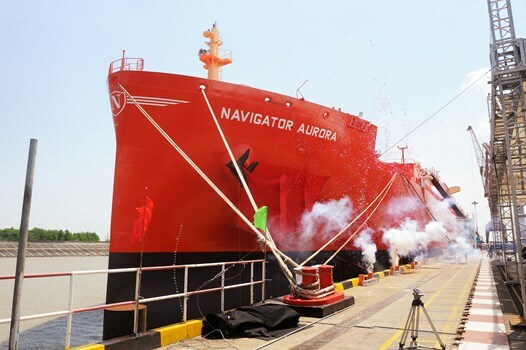 VIENNA, 04-May-2016 — /EuropaWire/ — Borealis, a leading provider of innovative solutions in the fields of polyolefins, base chemicals and fertilizers, has signed a contract with Navigator Gas for the long-term time charter of the vessel Navigator Aurora. The naming ceremony took place at the Jiangnan Shipyard in Shanghai, China, on 3 May 2016. The vessel was christened by Irene Giner-Reichl, Austrian Ambassador to the People’s Republic of China. Borealis and Borouge aim to proactively benefit society by taking on real societal challenges and offering real solutions. Both companies are committed to the principles of Responsible Care®, an initiative to improve safety performance within the chemical industry, and work to solve the world’s water and sanitation challenges through product innovation and their Water for the World™ programme.